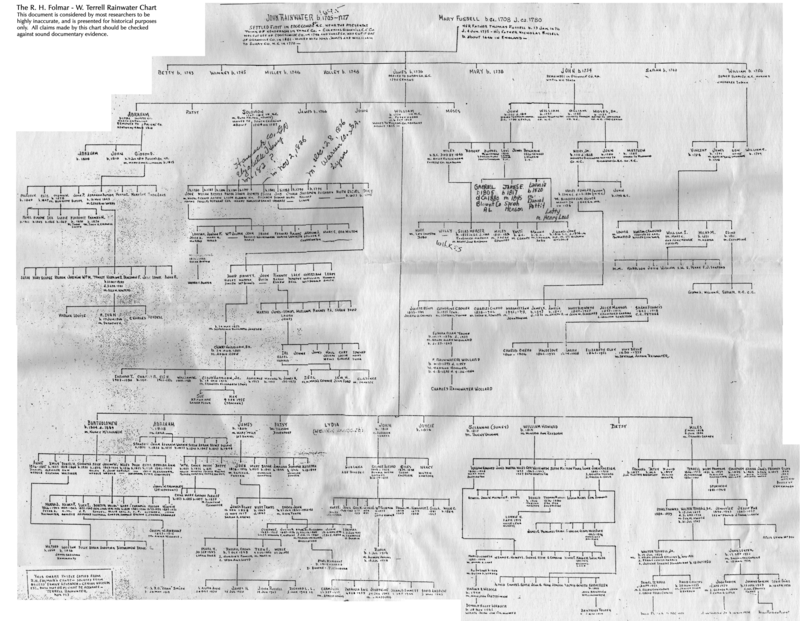 If you post this article to Ancestry.com, another website, or publication, please post the entire article, not excerpts. Please include the author’s name and the website URL. I’m simply asking that you not represent my work as yours, and not misrepresent the article as meaning something that it doesn’t. 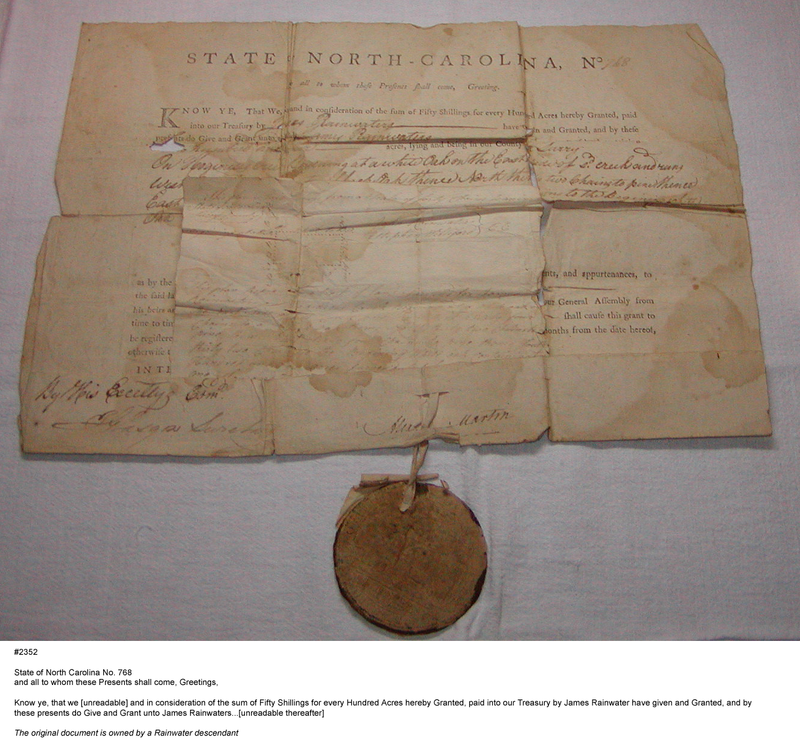 James Rainwater, son of John Rainwater and Mary Fussell, was born in North Carolina. His parents were married in or before 1735. In 1754, he served in the Granville Co., NC militia - something which under normal circumstances he would not have done before the age of 16. We therefore place the year of his birth between 1735 and 1738. Little is known of James Rainwater. He left no marriage record, no will, no family Bible. All that is known of him comes from property records, militia records and the occasional service on a jury (see Evidence for Early Rainwaters, prior to 1800). As I have assembled these lists, it has become apparent that the children of two different families have been routinely confused with one another – that is, the children of James Rainwater of North Carolina, and James Rainwater of Sevier Co., Tennessee. The difficulty for many researchers is that James is the link from their provable ancestors to John Rainwater and Mary Fussell. So far, none has been able to satisfactorily prove the names of James’s children. What we have is a tradition of these children, with nothing on which to base it. Over the years I have collected a number of lists of James Rainwater’s children. I don’t reproduce them here to humiliate the originators but to illustrate the thorny problem of proving descent from James. Just to further complicate things, the existence of many of the individuals on these lists in not in question – merely the identity of their parents. As an interesting twist, the Tabors dispute the conventional wisdom that William migrated to Kentucky around 1810. Rather, they indicate he settled in Alabama. This appears to refer to the William Rainwater who served in the War of 1812, not the William who ended up in Pulaski Co, KY.
Lisa lists Don Webber’s book and Hal Irving as her sources. If you do a search at the LDS web site for James Rainwater and Catherine Regan, this is one of the lists you will get. The composition of this list is unusual, since unlike the other seven, it doesn’t include Solomon or William. This list clearly refers to the family of James Rainwater and Charity Fowler of Sevier Co., TN. This list was came to us in a packet of research notes of Thelma Sargent. This list is drawn from the highly suspect Folmar Chart. It’s likely that this early list created in the 1950s or 60s, has influenced the composition of many of the later lists. James: There are at least four individuals who fit the age requirements. These are James who married Catherine McCall (TN), James who married Charity Fowler (TN), James the blacksmith (GA) and James the preacher (GA). The daughters listed as Sesame, Ann and Catherine are almost certainly the children of James Rainwater and Charity Fowler, although Sesame is actually a son – Sissum or Cessum.